Science Shorts: How Big Is Pluto’s Atmosphere? 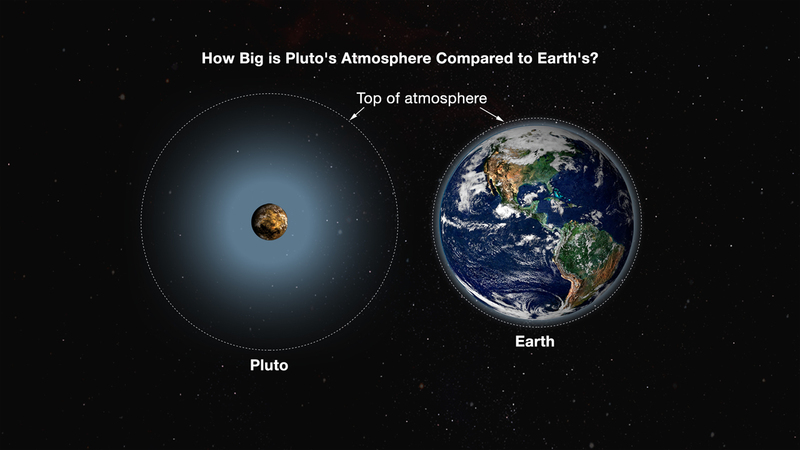 How big is Pluto’s atmosphere? This is not a typical question one finds in planetary science. Earth’s atmosphere has an equivalent thickness – the thickness if you compress the atmosphere to uniform pressure and density – of about 10 kilometers, or six miles. Compare this with the radius of Earth, 6,370 kilometers, and you see that the razor-thin thickness of Earth’s atmosphere is about 0.17% of its radius. Even if you consider the “outer limit” of Earth’s neutral atmosphere, what we call the exobase, that reaches about 600 kilometers altitude, the atmosphere’s equivalent thickness is only 10% of Earth’s radius—still very thin. So the volume of Earth’s atmosphere is tiny compared to Earth’s volume. But now consider Pluto. Its atmosphere has a near-surface equivalent thickness of about 40 kilometers, which is almost 4% of its 1,200- kilometer (or so) radius. But the “outer limit” of Pluto’s atmosphere is very difficult to define, although we know that it is very far from the surface. If one defines it similar to the way we define the exobase of Earth’s atmosphere, then Pluto’s atmosphere has an outer limit of at least seven times Pluto’s radius above it surface. This means that the volume of Pluto’s atmosphere is over 350 times the volume of Pluto itself! This illustrates what a strange and wonderful new kind of world we are about to visit and explore. And this estimate is conservative. 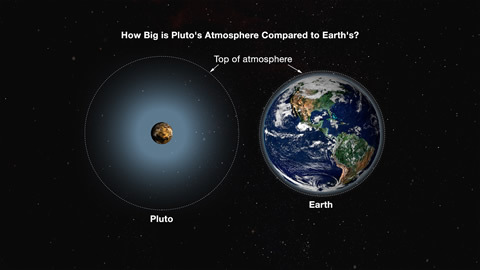 As I noted, the outer limit for Pluto’s atmosphere is ill-defined because of the gradual way that the atmosphere merges with the vacuum of space. It could in fact be farther than seven Pluto radii from its surface, and thus its volume would be even larger. Size will be one of the central questions we answer about Pluto’s atmosphere with New Horizons during the Pluto system encounter in July. The answer will have implications for many aspects of the atmosphere’s characteristics, such as the thermal structure, solar ionization, solar wind interactions, escape rate, and even its interaction with Pluto’s large moon, Charon. I can’t wait! Michael E. Summers is a professor of Planetary Science and Astronomy at George Mason University, and specializes in the study of the chemistry and dynamics of planetary atmospheres. He is a New Horizons co-investigator and member of the atmospheres science theme team.